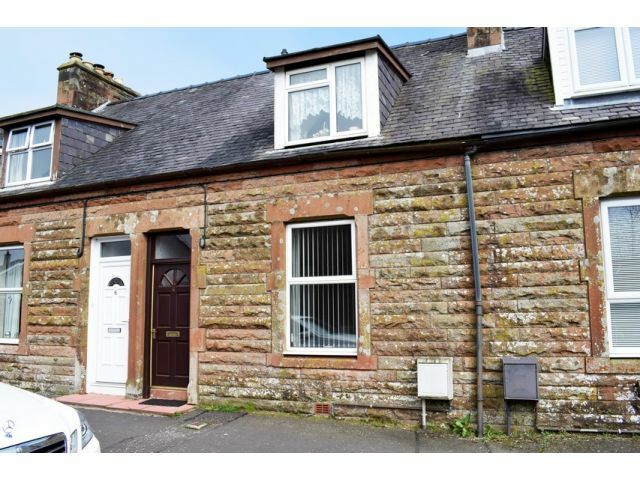 Offered for sale with no onward chain, this two bedroom cottage is situated in a quiet area of the town of Annan and is deceptively spacious inside and out. Sitting Room, Lounge / Dining Room and Kitchen. Two Double Bedrooms with Fitted Furniture and Bathroom. Outside there is off road parking and a detached garage at the end of the terrace and a small enclosed patio section with further large lawn area with mature planting and garden shed. Ceiling light, smoke alarm, telephone point. Radiator, carpeted flooring. Window to front with curtain pole and blinds. Ceiling light, picture rail. Electric fire with tiled surround. Radiator, carpeted flooring. Window to rear with curtain rail and blinds. Ceiling light, picture rail, storage cupboard. TV point, electric fire with tiled surround. Radiator, carpeted flooring. Window to rear with blinds. Ceiling light, large under stair storage cupboard. Wall and base cabinets, sink and drainer with mixer tap, tiled splashback. Plumbing for washing machine. Space for fridge freezer and cooker. Vinyl flooring. Door to rear garden. Window to side. Loft access, ceiling light, smoke alarm. Storage cupboard. Radiator, carpeted flooring. Dormer window to front with curtain rail. Ceiling light, range of fitted furniture. Radiator, carpeted flooring. Window to rear with curtain rail. Ceiling light, range of fitted furniture. Radiator, carpeted flooring. Opaque window to rear with blinds. Ceiling light, partially tiled walls. Three piece suite comprising of toilet, wash hand basin and bath with over head electric shower. Electric panel heater, laminate flooring. Detached garage and off road parking.Shared access to rear with Enclosed patio section directly at rear of house and further rear garden with lawn sections, patio and mature planting borders. Raised flower beds. Drying green. Garden shed. Open outlook to rear. Offers in the region of £108,000 are invited and should be submitted to lj Residential, 93 High Street, Annan, DG12 6DJ or by fax to: 01461 205037.